It’s been a while… So much life has happened in the few years that I have not been very present here. Our first daughter came into the world + is growing wildly into a fiercely independent little nugget of almost 3 years old. Life shifted in so many ways after becoming a mama, and my creative works have ebbed + flowed with the current, rising + falling. I honestly thought the magazine, and even this blog was dead + buried. I thought there was no way I would have the time to devote to this sort of creation ever again. But life has a way of making way for the things that need to be birthed. After some serendipitous conversations + new perspectives on how to co-create alongside others, this old baby of mine is being resurrected + will be ripe for it’s relaunch this summer on June’s beautiful new moon. You may also notice that we have a sparkly new website. I felt like with the relaunch + shift of seasons, the face of the site needed a new vision as well. I’m still in the process of updating all of the old blog content, but the bones are here + alive. In honor of the new site, I have teamed up with my babe Krista from Kantha Bae (the one whom you can thank for helping me bring this vision back to life in the first place, if wasn’t for her, none of this would be happening) for a fun GIVEAWAY. 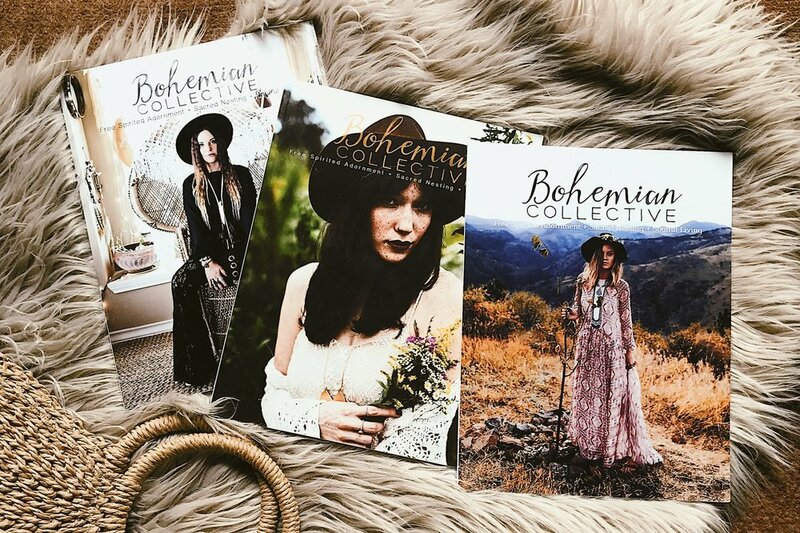 Go enter to win some beautiful boho goodies over on our instagram @bohemiancollective today at noon CST. We are also taking submissions for advertising in the summer issue. Spots are filling up fast, but we have different sponsorships available to accommodate different budgets, including some very affordable options for small maker shops! We are not currently taking submissions for article content, but we are taking submissions for blog contributors. If you feel like you have something to bring to our tribe, please apply through the form on our Contact page. LASTLY, I would be so honored if you would leave a review below in the comments about our past issues. I will collect a few responses + add them to our site here with a link back to you as a thank you. They may even show up in the magazine! Thank you for your time in advance.